I mentioned that Bob and I are exploring the idea of building our own hallway table. Not only because I was searching for my next DIY project, but also because we have some unique specifications for the table as the hallway is only 40” wide and we can’t have it jut out too far, preventing people from being able to walk through. Also, it needs to be at least 17” deep as we have plans to house our cat litterbox underneath for a semi-hidden space. We found this table on JC Penney.com and were drawn to the modern lines. However, the size of this table wasn’t going to work for what we needed it for. Let’s build it ourselves! Hey, what do you want from me? Bob’s an architect and I stopped taking art classes in 6th grade, thereby admitting my artistic failings early in life. 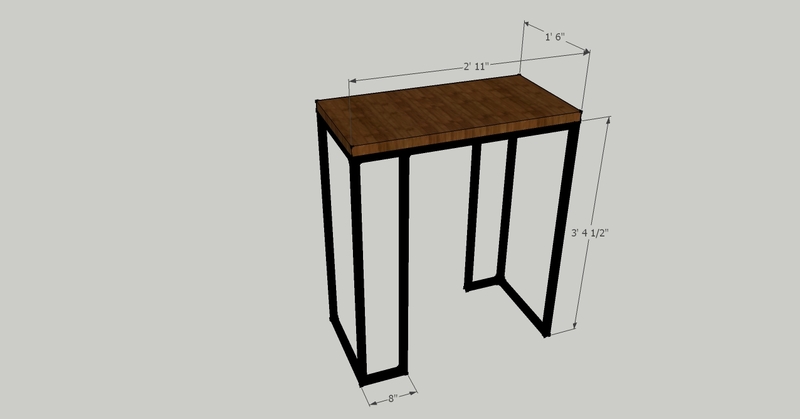 Using Google Sketch Up, Bob created this drawing of our table with the dimensions we will be looking to re-create. Stay tuned for a post on finding the materials. The inspiration table used a combination of wood and metal, but first glances at metal tubing prices are telling us that we would be spending more on the table materials as we would have on just buying a new table. Definitely not the goal – I want to spend less than $60 on this bad boy, if possible! We’ll see how this plays out. . .